Our Premier Garden Sheds represent exceptional quality for a very affordable price. The doors are hinged for added security. 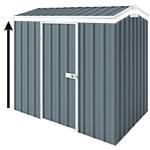 The Absco Premier Garden Sheds are designed for maximum strength and manufactured from low maintenance ribbed steel sheeting. So if you're looking for a fuss free sturdy storage shed then look no further. It's simple to construct like all of Absco's garden shed range. This 3m x 3m x 2m double door zincalume shed is a flexible storage unit which can store household goods such as gardening tools and sporting equipment. This is a great addition to your backyard. Engineered to withstand winds of up to the wind rating of N2 (147km/h). Additional cyclone kits can be purchased to increase the wind rating to W50 which can withstand winds of up to 180km/hr.